Parent story: Naruto Movie 1: Dai Katsugeki!! Yuki Hime Shinobu Houjou Dattebayo! First off, one should know not to take this special very seriously. For one, the special shows every single character attending the sports festival (even already dead characters). I myself enjoyed pointing out some people like the 4th Hokage and Itachi from the crowd. Second, the plot revolves around Naruto needing to use the restroom, but to his dismay, he just can't seem to find a toilet without interruptions. The animation in the Sports Festival is the same animation used in the actual movie, so it is high quality in terms of detail. The sound is... Well it sounds like what any Naruto scene would sound like: Naruto sceaming, background music being fast-paced, and Naruto screaming some more. The characters pretty much act the same with Shino being his weird self and Shikamaru complaining about every little thing. But what got me was Hinata trying to tell Naruto her one dark secret about him. That seemed out of character to me. And as for the enjoyment part of the special? It really depends on whether you enjoy watching a 20 minute show full of nothing but "I NEED TO FIND A TOILET!!!" or not. Overall, this might be fun to watch the first time, but you really don't need to watch it a second time. This special add for the naruto series makes a great pass time for those tired of their serious life. A great humor (that really doesn't have anything to do with the original time flow of the series) makes it a light-hearted 'Special'. You'll die of laughter, every moment as Naruto struggles to keep in his &quot;business&quot; that makes every watcher laugh! Though the time flow of Naruto wasn't really thought about in this 'Special', the abilities and special attacks of each character are still the same, making the whole 'Special' more hilarious! As the whole story revolved around a 'school' festival with all the known genins involved. Those Genins were basically competing for first prize nothing more, they were practically doing this for fun. Apparently though, too bad for Naruto, because before the special Sports festival started he had a major tummy problem and really HAD to go BAD! but whenever he would be able to get even an inch close to the bathroom something unfortunate happens and destroy's his chance of getting his 'business' done! The creators must've had this kind of idea pop into him, while watching some school festival in schools and stuff. Either way, this was a great addition with the seriousness Naruto was getting onto. After all, having Naruto serious all the time destroy's his humorous attitude! (if you really don't care for laughing, try this out, even if you might criticize some of its point, just forget about the seriousness of it all and try to enjoy a 'different' kind of theme once in a while.) Enjoy! The story has nothing to do with the original Naruto stories. Only the design and the character's abilities are the same, but I think even the characteristics changed (if it can change in 11 minutes). They are absolutely overdid. The background of the whole thing is a sports festival in which all of the well known leaf-genins are competing. As a matter of fact it's absolutely irrelevant. For example milk-drinking is one part of the competition. It has nothing to do with sports, only with the main poop problem. 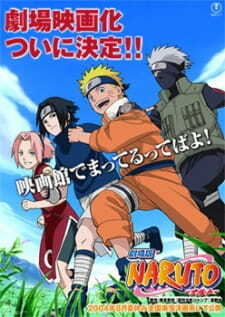 It's a really stupid story about Naruto who can't go to the toilet in time, and how his comrades prevent him from poop. For example Shino, Hinata, Chouji, even the Akatsuki and Anbu members. Characters from every part of the original Naruto story. Anyway the music and the background sounds are going well with the whole story. Personally I don't like the Naruto movies, so I think that short episode was good to make me feel; the following Naruto movie was the best I've ever seen.